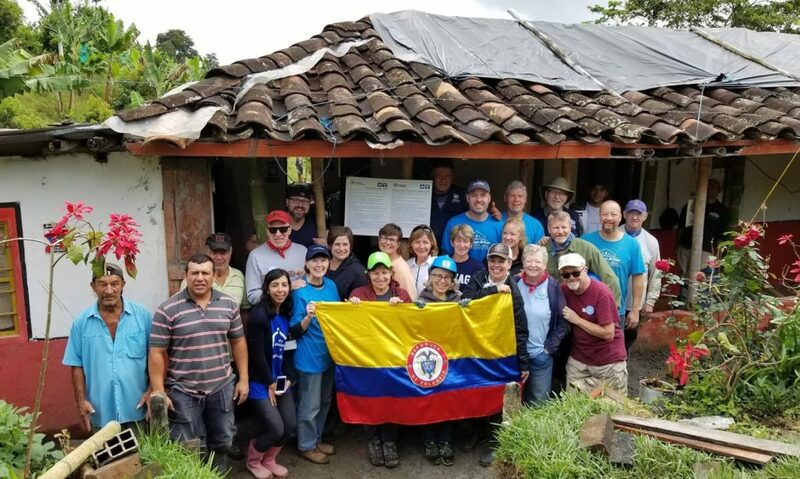 Our group of 19 people from Immanuel Presbyterian Church in Tacoma had spent a year fundraising and preparing for a service trip to build houses in Guatemala; part of the church’s multi-year commitment to partnering with Habitat internationally as well as locally. When they found out about the change of country, every single person agreed that we should move ahead with the new adventure. Thanks to some quick work by Habitat Global Village staff in Atlanta, GA and amazing support from Alex Trettin and his team at Travel Leaders to change all of our tickets, we were able to get everything switched from Central to South America. Once in Filandia we were greeted by our Habitat Colombia leaders Theodora and Carolina. Over the course of the next 5 days, they trained us and put us to work in two areas: one group working on the rehab of an existing house that was no longer safe for the owner and his family. The other group worked nearby, constructing a new brick house and digging a large hole for a new septic tank. The work was hard, but very rewarding as we saw great progress from our efforts each day. Here’s to a world where everyone has a decent place to live!